Lampard will captain the side in their final game against Costa Rica on Tuesday. RIO DE JANEIRO: Frank Lampard echoed England colleague Steven Gerrard on Monday by saying that he has yet to reach a decision about whether to prolong his international career beyond the World Cup. England manager Roy Hodgson has revealed that Lampard, 36, will captain the side in their final game against Costa Rica in Belo Horizonte on Tuesday, after which the squad will return to London. Gerrard, 34, said on Sunday that he needed time before making an announcement about his international future and Lampard, who was released by Chelsea at the end of last season, is in the same position. Asked if Tuesday's Group D fixture against Costa Rica will be his final game for England, Lampard told BBC radio: "I don't know. "I knew the question would come regardless of how we did in the tournament. I am going to get home and make a decision at that point, because I have my own future at home to sort out as well. "This is not the time and place here. Making judgements when you are sitting in your room for a month on your own, you don't always come up with the right judgement." England's elimination at the World Cup has already been confirmed after they lost 2-1 to both Italy and Uruguay in their first two games. Lampard has been linked with a move to Major League Soccer in the United States, but Chelsea manager Jose Mourinho says he will always be welcome at Stamford Bridge and could one day manage the club. "That's nice. I have a good relationship with him. 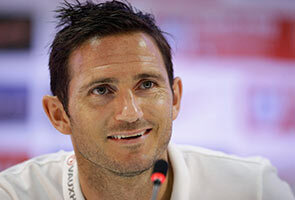 I always will," said Lampard, who has won 105 England caps. "He was a big influence on my career and the club is special to me. I don't know what I will do after football, but if there was any club I would want to manage, then everyone knows who it would be."